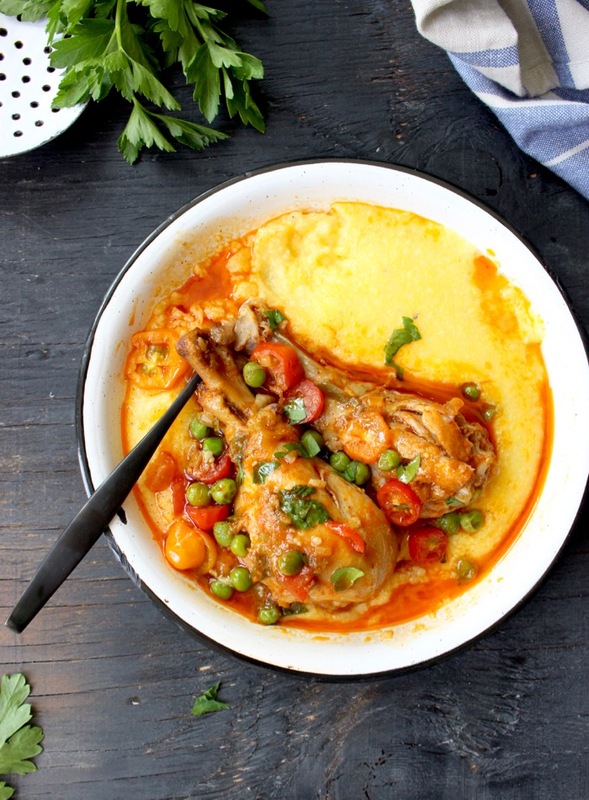 This easy chicken stew over yellow polenta is a fine, rustic peasant meal, the kind that feeds not only your hunger but the depths of your soul. 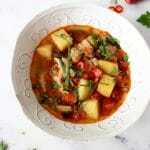 Today I’m just bringing back to the front page an easy chicken stew, which is my Grandma’s recipe for chicken stew. 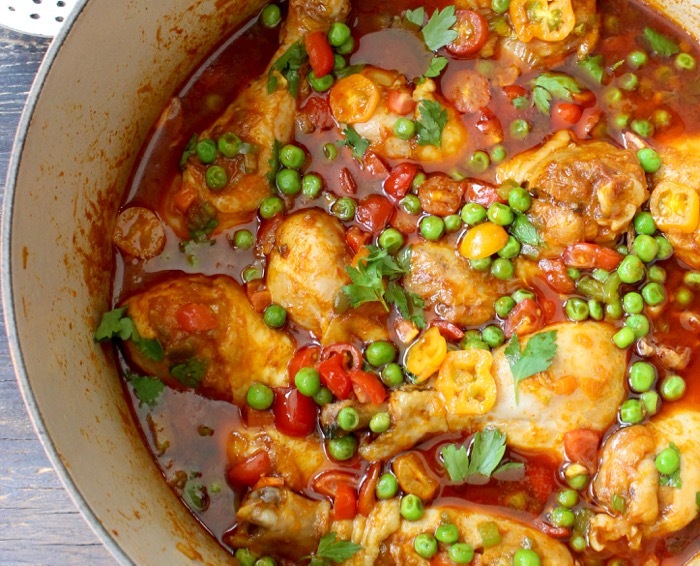 The best chicken stew recipe that stood the test of time for generations. 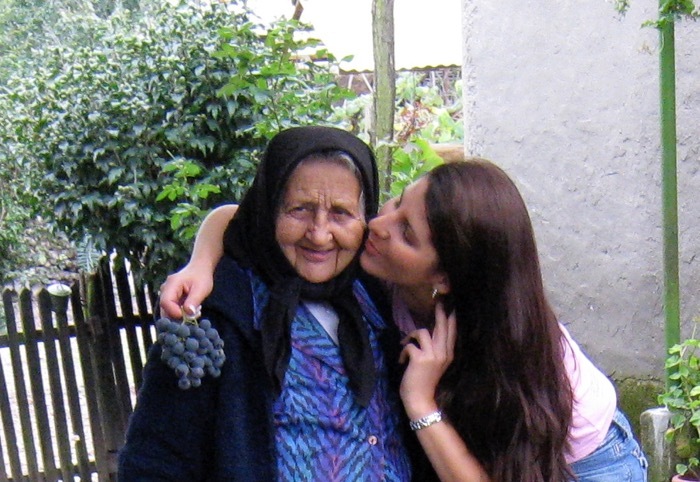 With a very heavy heart I bring it back today, as we just said our final goodby to my sweet grandma. She’s finally reunited with grandpa and resting in the embrace of God. 92 years she was a blessing on this Earth, yet gone way too soon. Way too soon for my heart to be okay with that finality, way too soon…. So I made a pot of her rustic easy chicken stew that used to be our finest Sunday meal, ready just in time for when grandpa would return from church. It’s crazy how time stands still, and you feel the inconsolable pain for that which can not be replaced. And there’s nothing you can do to change that, or make it better, just feel the gut wrenching feeling of irreplaceable loss and sorrow. I felt my tears running down my face as I was stirring the pot and struggling to compose myself, to be strong. Trying to find some momentary consolation in the fact that she was old and her life has come full circle. Yet the heart doesn’t understand numbers, it doesn’t rationalize, it just hurts… A paralyzing feeling that makes you question how you spend every waking moment of your life.. Whether I might be wasting priceless time doing whatever.. I tried to gather my thoughts about a thousand times, moving on to the next recipe on my editorial calendar, but I had nothing. I had nothing to say, not a word came out about that much-loved Panzanella Salad I photographed a couple of weeks ago, the Italian tuna bruschetta I just couldn’t wait to go on and on about. It seems as just like that I lost my inspiration, my flame, my drive to make beautiful wholesome recipes for us. I had nothing to give. I strolled through the garden and snatched a couple of the tomato leaves to crush in my the palm of hand. I find comfort in the earthy, grassy scents around me that remind me of them..
And so I pulled myself together and made grandma’s easy chicken stew for dinner, the one she always made for us. Tough I was always in my grandpa’s shadow, imitating everything he did, it was grandma who was the true Boss Lady at the shack. She’d start this easy chicken stew early on Sunday morning, while grandpa was still shaving outside, under the grapevine, with a small mirror hanging on one of the knots in the trunk of the vine. She would pick carrots and lots of parsley from the garden, a handful of fresh tomatoes and when in season fresh green peas. I used a leek as the base for the stew this time, it makes a nice flavorful thick sauce as it melts together with all the flavors. Crazy thing is, I could actually hear her make fun of me as I was stirring the pot yesterday. Something to the extent of “hey girl, stop crying before those tears are gonna make that chicken stew too salty” , then she’d laugh about it. So typical, so her. I could hear conversations between her and grandpa, again pointing out to my unraveled emotional state. So I started on the polenta because what else was I gonna feed the Batman with grandma’s stew ? It had to be polenta. Plus he loves polenta..
And the tears starting rolling in again, inconsolable tears of longing for both of them at this point. 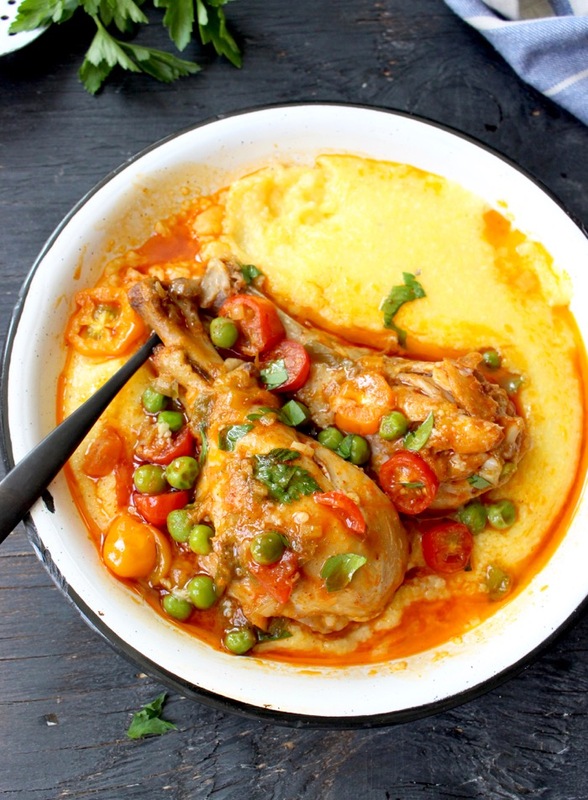 I made for her this exact chicken stew with polenta, her own recipe, and she’d say I make it so much better than her, that it is perfect. I know that’s not the truth, she made it the most perfect of all, with stuff she picked from the garden on her way into the kitchen. But the first time she said that I believe her! Which in hindsight I really needed to believe so that my creative spirit had the courage to come out.. So that “ Ciao Florentina “ would be born. That little insane seed of faith was absolutely crucial for me to cook again. You see, this blog wouldn’t be without the man in the photo, and it wouldn’t be without grandma. They are the true Owners of this place, the endless inspiration and forever on the board of directors. 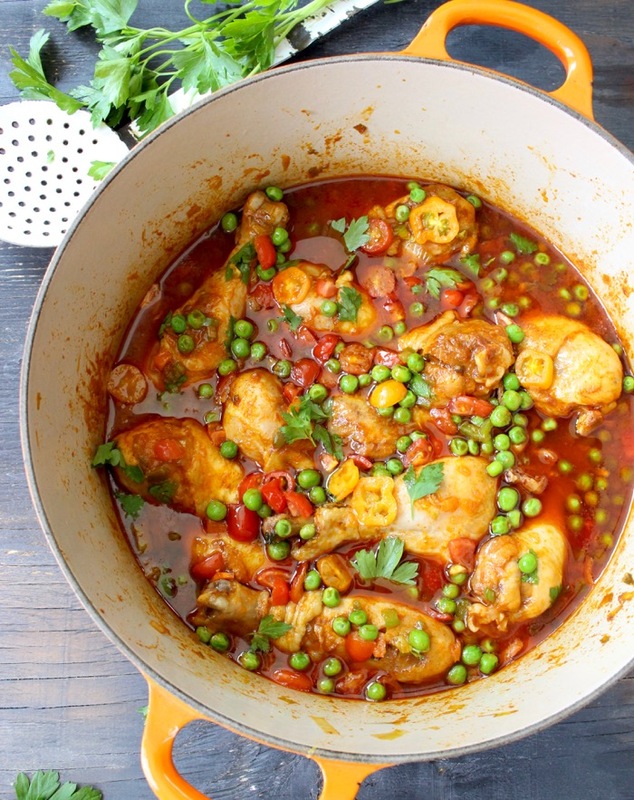 I find incredible comfort in bringing back this easy chicken stew recipe today. I find pure comfort in just doing it, in not thinking about Google and seo and wonder if I can ever rank for grandma’s easy chicken stew recipe. I find comfort in taking a photo of a rustic dish that is filled with love and memories, in capturing a moment in time that will never be reproduced the exact same way ever again. 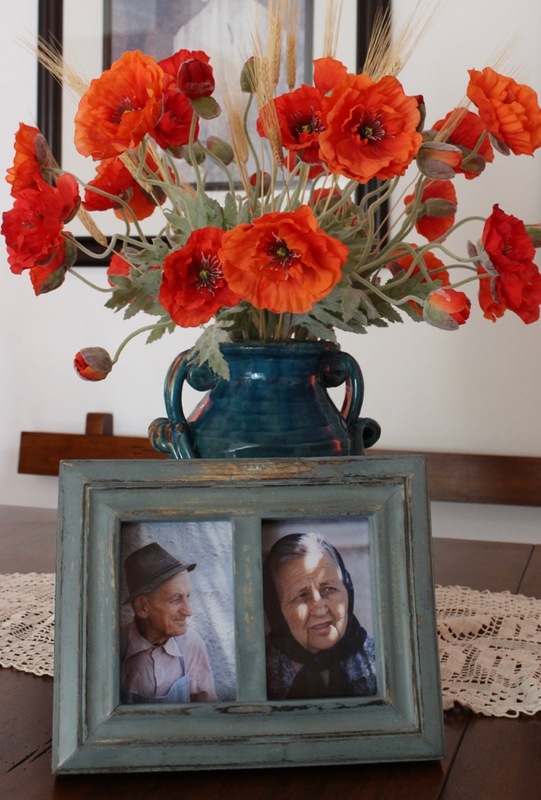 I find comfort in not worrying about making my photos Pinteresting, because I want these photos to capture my grandma. And so maybe you love them, maybe you don’t, whatever the case, I know this can not be made any better, and prettier any more Pinteresting. 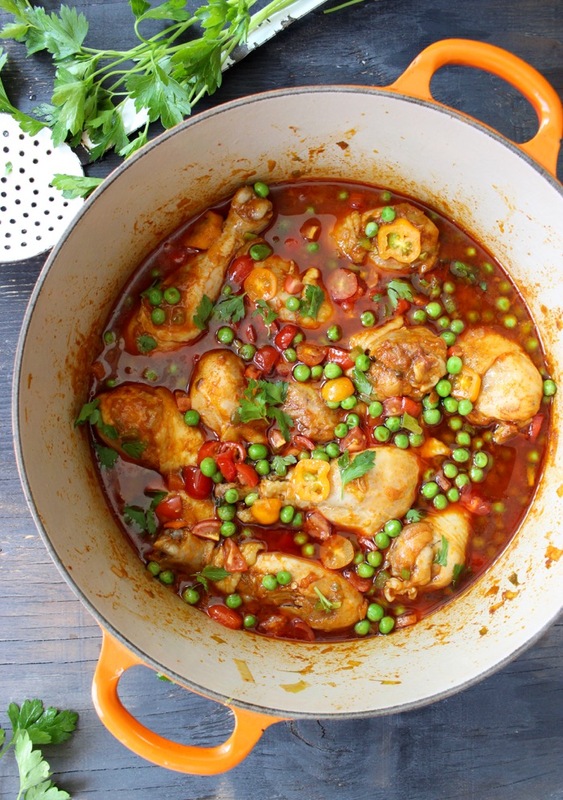 Because this is real life and love, the perfection of imperfection, it is more than grandma’s recipe for easy chicken stew photographed and styled for the masses. Actually nothing here on CiaoFlorentina targets the masses, and that is perfectly okay with me. To all my critics who think I need to find my blogging voice before I can make it big time, to those who think I run a lifestyle food blog because I am lost. I assure you that isn’t the case, I found my voice, and that is their voice. Grandpa’s and Grandma’s voice. Regardless if Grandma’s easy chicken stew will be the most Pinned recipe on the internet or get lost in the meaningless shuffle, I assure you it will continue to make its way around the world and humbly grace family dinner tables for generations to come. Who could have guessed that such an easy chicken stew could stir up such powerful emotions and memories, that it could capture a moment in time with your senses..
With my countless repertoire of truly delicious recipes, I have yet to even come close to capturing the perfection of nature, love and life as it has been captured by grandma in this most simple easy chicken stew. Just leeks sautéed in a lug of olive oil until they start to catch some color. 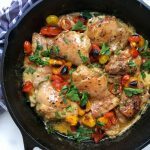 A marriage of green bell peppers, carrots, parsley and tomatoes, simmered gently with free range, pasture raised organic chicken infused with sweet flavors of bay and paprika. We always used water for this stew, never stock. The stock naturally happens from the chicken and veggies cooking down together into the finest gravy you could dream of. Use some fresh green peas if you can find them. Otherwise the frozen kind would do just fine. Make the polenta to go along, make real polenta and stir it with a wooden spoon. Grandpa loved making an extra thick polenta, then dump it straight out on the wooden table to cool off. In no time it would be ready to be sliced with a string. As a little kid I remember watching him in action mesmerized, and waiting for the first polenta slice with my little chin resting on the edge of the old wooden table. You know… I have since dined at some of the fanciest restaurants, enjoyed meals prepared by some of the most renowned chefs, and still, not one of the finest meals came even close to capturing the perfection of nature, life and love as grandma’s easy chicken stew. Slice the leek lengthwise in half then dice it up. Add it to a large bowl of cold water and allow the grit to drop to the bottom for a ew minutes. The leeks will float to the top. 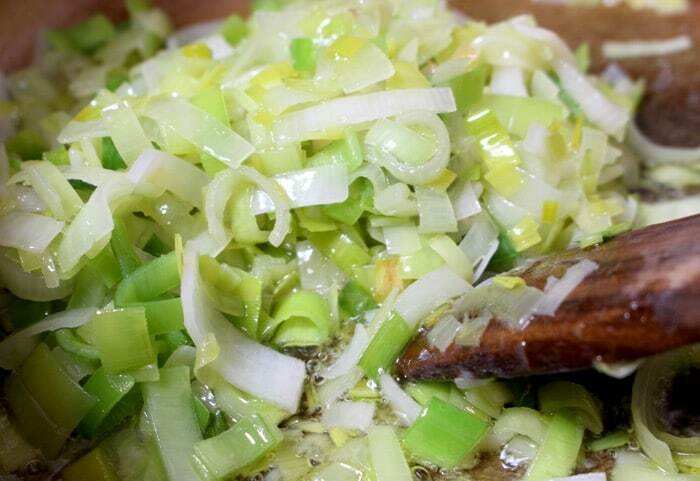 Use both your hands and transfer the leeks to a large kitchen towel to drain. In a large cast iron pot on low flame add a lug of olive oil. Add the leeks and a pinch of salt and sauté until wilted and they start to catch some color. Make sure not to burn them. Add the carrots and half of the diced bell pepper and toss to coat. Cook for a few minutes then add the paprika and sea salt. Give everything a good stir. Add the chicken to the pot and use a wooden spoon to stir well to coat all over in the paprika infused olive oil with leeks. Add the bay leaves and parsley sprigs then pour in enough water to come up the sides of the chicken but without covering it. 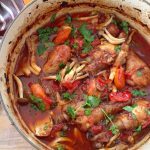 Bring the chicken stew to a gentle simmer and cover tightly with a lid. Allow the stew to simmer for 45 minutes. After 45 minutes have passed add the remaining green bell pepper to the pot and continue cooking partially covered for another 10 minutes or so until the sauce has reduced to your liking and the chicken falls apart when stabbed with a fork. Add the green peas and cook an extra 2 to 3 minutes if using fresh peas. Adjust seasonings to your taste and remove from heat. Add the tomatoes to the pot with the chicken and gently stir them between the chicken and under the sauce. Cover back with the lid and allow the stew to sit covered for a few minutes for the tomatoes to release their juices into the sauce. Serve hot over polenta and sprinkled with the chopped parsley. 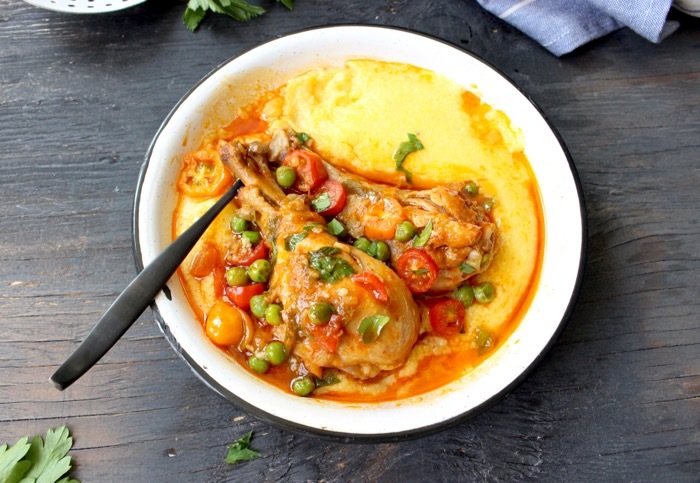 While the chicken stew is simmering away, make the polenta. Bring 10 cups of water to a rolling boil and season with the sea salt. Whisk in the cornmeal into the boiling water until incorporated. Turn the flame to low and partially cover with a lid. Simmer the polenta on low flame for about 1 hour until cooked through and thickened. Make sure to stir well with a wooden spoon every 15 minutes or so. Once the polenta is cooked remove it from heat and stir in the cold butter until melted and incorporated. Stir in the milk or cream and serve with the chicken stew on top. I am sorry to read about your Grandmother. The chicken stew looks amazing, it is clear she had a big impact on your love of food and that is such a beautiful thing. I will be pinning the stew to make later, it looks like a dish we’d love, lots of big bold flavours. You have me in tears! This reminds me so much of my mamma and papà and how I felt and still feel for them. They gave me life but they gave me so much more that I have a difficult time putting into words. My mamma longed for the day when she’d be reunited with her love. I can be peaceful with the thought that they are still watching over me — but the pain is still there. We certainly were blessed by having such wonderful people love us, weren’t we?! I am so sorry for your loss but I’m happy that they are with God and the ones they love. Thank you for sharing this beautiful story. Your words are from your heart and so full of love. Blessings on you and all your family as you grieve the passing from this life your precious grandma. She and your grandpa are watching from heaven and are smiling. Your tears are love, don’t hold them in, ever. I am so grateful to receive this wonderful and inspiring food site. So sorry that your grandmother passed! My father’s funeral was yesterday so this really touched my heart. Sounds like they both blessed your life so much, you were very lucky. This recipe sounds wonderful and I can’t wait to try it. Thanks so much for sharing your grandparents and their wonderful recipes with us! What a beautiful post and wonderful looking chicken soup. After nearly 15 years, I’m still missing my Nana something fierce. Her birthday was just this week and the sensation of loss renewed. She was also 92, and while there’s comfort in the thought of them living a full, long life, it just doesn’t bring them back. Wishing you some strength through your mourning. Grandma’s recipes are just the best, aren’t they! 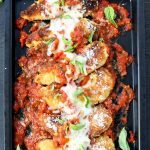 I have never been able to recreate any of mine’s recipes, but maybe I should give it a go! Ugh! My heart is breaking for you. I’m so sorry for your loss. I love, though, that you have your family recipes and wonderful memories to comfort you. They are something easy to reach for when you want to be with someone who’s not here physically. What a wonderful dish! It looks amazing! Our best and most beloved dishes are usually attached to loving memories of our beloved ones and the times spent cooking and eating. Your grandparents may be gone but their love of good food lives on in you and you have the eloquence to share it with the rest of us. This dish looks wonderfully rustic and I feel like I need a very big spoon to dig in. Mind if I come over and join you for some stew?! This sounds so delicious. Grandma’s recipes are always the best. Perfect comfort food….and awesome leftovers too. This is exactly the kind of meal I like to make when I need comfort food. 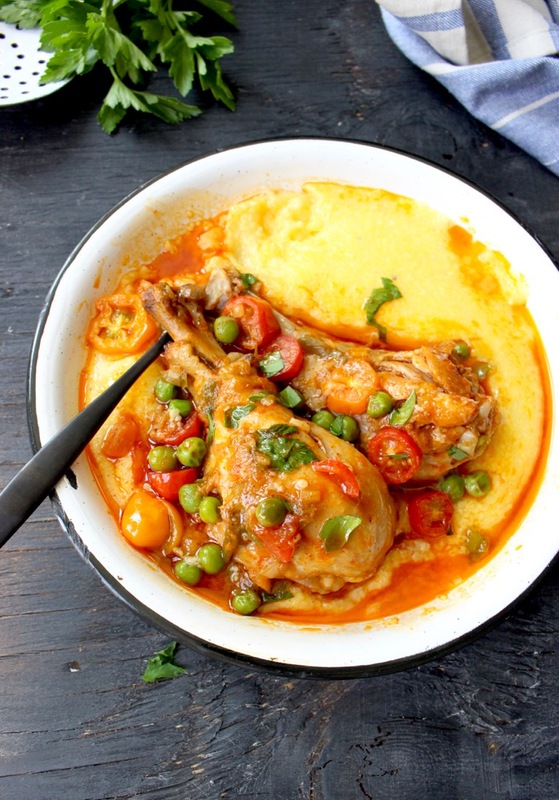 Your grandma’s chicken stew when down well here in London today. Glad to find your site. 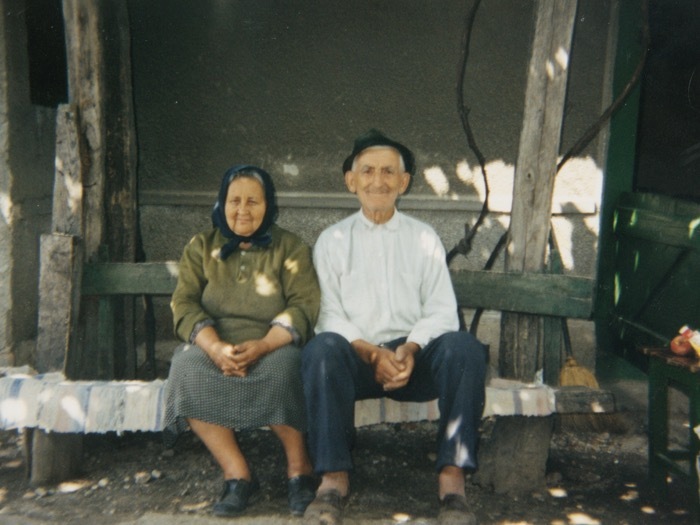 The story behind these two wonderful people is such a nice addition to the recipe. 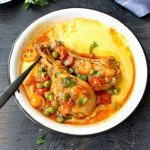 I searched for polenta upon reading your section “About” and found this. So glad I did and cannot wait to try it. Thanks for bringing along a heartfelt recipe!